Reports and data gathered by NAFSE's Capacity Discovery Project. This list includes all unpublished reports and data of interest in our region. Brief summary of paleoecology in the area. Pine-oak forests comprise 46% of the vegetation of Cape Cod National Seashore. Flammable ericaceous shrubs, especially Gaylussachia baccata, dominate the understories and combined with heavy litter fuel loads increase the probability of intense surface fires. 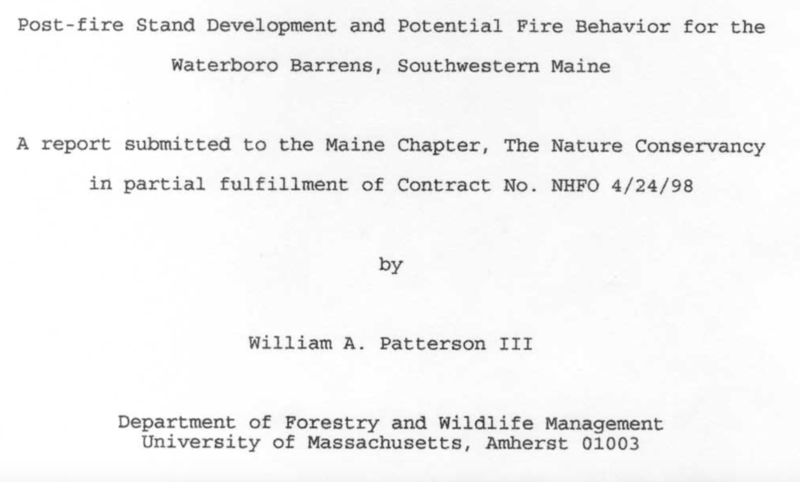 Past research has evaluated the use of brush cutting and prescribed burning to reduce fire hazard and to construct custom fuel models to predict fire behavior. Results suggest that the two treatments combined will better accomplish this goal than when they are applied separately. The goal of this project is to evaluate the effectiveness of combined treatments. Alteration of natural habitats by woody invasive plants is a concern for land managers throughout the northeastern United States. Invasive species – both native and exotic – can adversely impact plant communities and alter fire regimes. 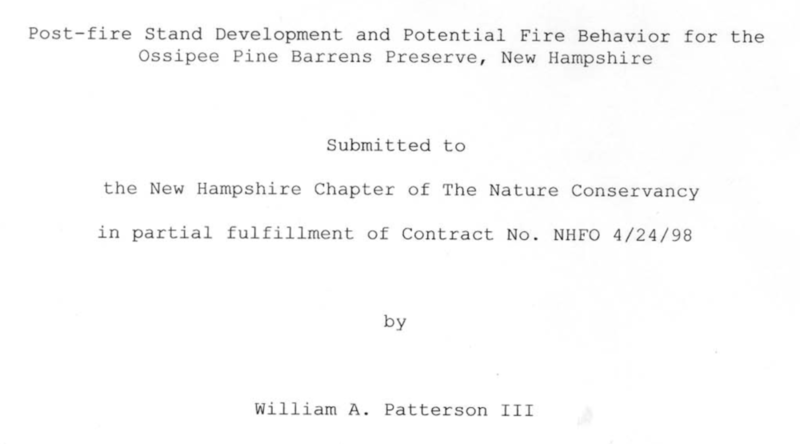 Although there is some information on the impacts of invasive species on habitats in the Northeast, few studies have addressed best management practices for controlling or eliminating these species and no studies have evaluated their impacts on fire regimes. In the Northeast, land managers are combating the deleterious effects that invasive plants have on other species and natural communities with attempts to remove them or substantially reduce their density. Control methods vary depending on the target species’ growth form, the extent of the invasion, and other species and resources at the site. Mechanical treatment, prescribed fire, hand-pulling, and application of herbicides, alone or in combination, have all been used to attempt control. Woody invasive plants are often difficult to eliminate due to their ability to sprout from stems, stumps, and roots. Successful control of these species requires understanding temporal variations in their below-ground resources. Total non-structural carbohydrate (TNC) reserves in the roots of woody species support growth following disturbance and generally follow an annual cycle of depletion and replenishment. This study evaluates the effectiveness of treatments when applied during periods of decreased TNC reserves. Treatments were applied to seven invasive shrubs (Cornus racemosa, Rhamnus cathartica, Rosa multiflora, Berberis thunbergii, Lonicera morrowii, Smilax rotundifolia, and Cytisus scoparius) at three different sites in Massachusetts and New York. Treatments included cutting and/or burning, applied singly or in combination, in either the dormant or growing seasons. TNC were depleted following all treatments. Dormant-season-treated plants, whether cut or burned, sprouted and replenished their reserves within the following growing season. For growing-season-treated plants TNC remained depleted longer, with a greater effect on plants that received more treatments. For most species studied, TNC recovered to pre-treatment levels by the end of one growing season without treatment. Sprout growth was influenced by the extent of carbohydrate reserves present before treatment. Biomass and heights of sprouts were significantly lower in growing- season-treated plants than those treated in the dormant season, even when data were adjusted for different lengths of recovery time. All treatments reduced the cover of the target invasive shrub. As the plants sprouted, they regained some of their initial cover and are expected to dominate without further treatment. Timing treatments to the cycle of TNC can increase the effectiveness of control methods, although repeated treatments may be necessary for several years. Invasion of grasslands by woody shrubs can alter existing fire regimes and give rise to problem fire behavior. Invaded areas are likely to burn less often but with more intensity. Abandoned pastures on Naushon Island, Massachusetts (USA) which have been invaded by the woody vine Smilax rotundifolia follow this pattern. 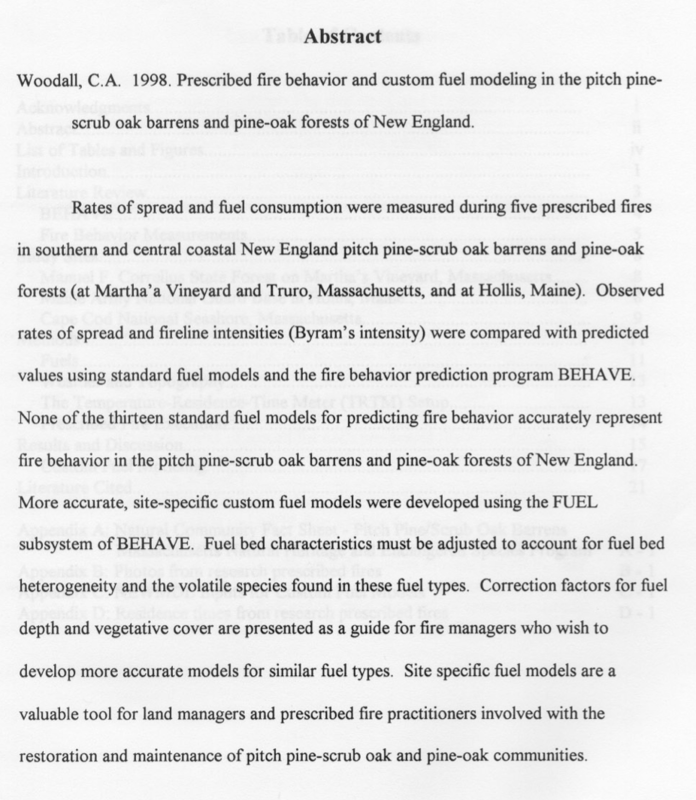 I evaluated the usefulness of standard and custom fuel models for predicting fire behavior observed in a 0.5-acre (0.2-ha) experimental burn. Custom fuel model development required characterizing fuel load and fuel bed depth of the experimental burn plot – a task complicated a dense mat of vines with 100 % cover to a height of 3 to 6 ft (1 to 2 m). This was done by measuring the height of fuel beds, estimating 3-dimensional cover by modified point-intercept sampling, and harvesting live vines and leaves and dead woody and non-woody litter and vines from 1 m2 cubes. From these data, I developed regression equations to estimate fuel load using fuel bed depth. 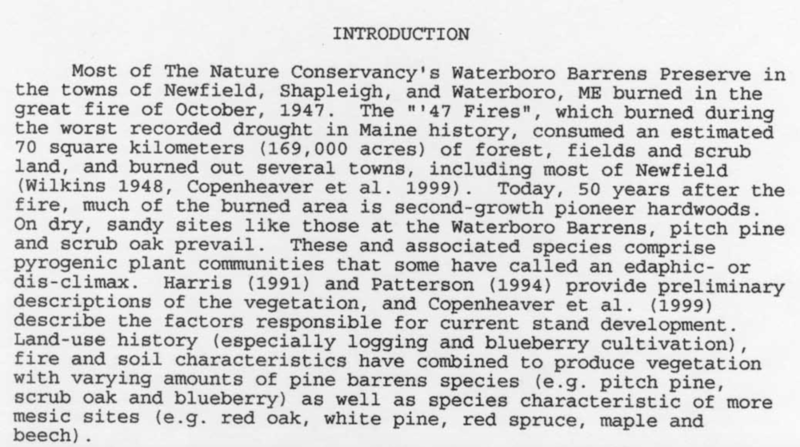 The goals of this project were to determine how fire and vegetation have interacted in the past 150 years in the central Martha’s Vineyard, Massachusetts woodlands, and to use this information to determine what management actions could be taken to reduce both the current and future fire danger while protecting unique plant and animal communities. Data were collected from intensive and extensive vegetation sampling, as well as from the interpretation of aerial photos. Two fire regimes were defined for the area: the late historic (1850-1955) and the modern (1955- present day). Data were collected on Manuel F. Correllus State Forest (MFCSF) which comprises 5,190 acres (2,100ha) of scrub oak (Quercus ilicifolia), oak woodland (Q. alba, Q.stellata, and Q. velutina), pitch pine (Pinus rigida) forest, and conifer plantation (primarily Pinus strobus, P. resinosa, and Picea glauca) vegetation in the center of the Island. The vegetation of the Forest has been subjected to frequent wildfires for as long as records are available and was probably burned before the arrival of Europeans in the early 17th century. Using the data collected, the stands of MFCSF were grouped into six vegetation types, and six fuel types. Six custom fuel models, which are assemblies of vegetation structure data that are used by fire behavior simulations to predict fire behavior, were then created from these six fuel types. Using the fire behavior simulators, BEHAVE and FARSITE, potential fire behavior on the Forest was then evaluated.